LinkedIn is the largest professional networking site available today used by those on the low end of the business totem pole all the up to CEOs of international conglomerates. LinkedIn provides a way to connect with other professionals and will help you stay in contact with millions of users. LinkedIn is strictly used for exchanging knowledge, ideas, and employment opportunities and has increasingly become a leading tool for helping individuals expand their networks as well as a way to find jobs in their field. What Should Be on My LinkedIn Profile? LinkedIn is a professional way to promote your personal brand online. 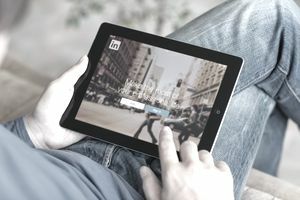 LinkedIn is usually one of the first websites to show up in search engine results and is, therefore, a great tool to establish your online presence and connect with professionals. Think of LinkedIn as a more dynamic and visual version of your resume. You can include traditional professional information, such as your education, expected graduation date, work experience, college awards, clubs, and hobbies. But rather than just listing this information, LinkedIn allows you to expand on each point. You can share projects you are particularly proud of, such as a PowerPoint restoration presentation that you did for your architectural design class or a brochure you designed for the non-profit where you volunteer. You can also include a headshot though it should not be a selfie or other kind of casual image. You want to present yourself as polished, professional and you should dress the way you would for a job interview. One of the best features of LinkedIn is the ability to include references and recommendations. If you have past professors or managers who appreciated your work, you can request that they submit a recommendation, which will show up on your profile for prospective employers to see. If you do this, be sure to have each reference say something different about your skills and work ethic. LinkedIn also has thousands of groups related to virtually every industry and niche you could think of. You can find like-minded professionals in your area who participate in these groups. They often discuss the latest trends in the business, post advice, and share job postings. Joining and getting involved with these groups is a great way to expand your professional network. LinkedIn has a powerful job listing section as well. Unlike other sites, listing a job on LinkedIn requires a fee, but that does eliminate the scam jobs so it's worth it. LinkedIn also makes it easy to research the company you're interested in, other staff members, and the job description you're applying for is usually described in-depth. You can even connect online with the hiring manager to discuss the role via LinkedIn's InMail service (although the site only allows for five free InMail messages—after that, you need to purchase a premium version which costs $30 a month. While LinkedIn can be essential for students looking for an internship, or a first job, remember that LinkedIn is for professionals and you must maintain a professional presence in all of your interactions, posts, and photos—this is not Twitter where people often vent their frustrations or discuss their political views. When used thoughtfully, LinkedIn can be a powerful tool for your job search. LinkedIn also has something called The Pulse, a section where people can post articles. Many of these are from industry leaders, but budding professionals can also post content. Articles often include tips on how to manage productivity and news about industry trends and changing business models. Engaging with authors and posting your own content is a useful way to build your network and get your name recognized in the industry. Summer Job or Internship - What's Best for Your College Student?